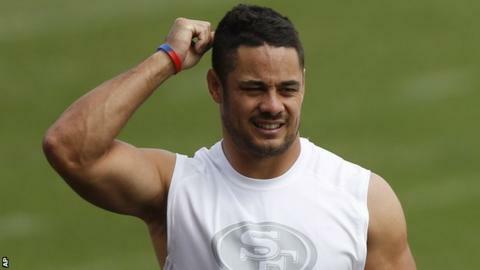 Jarryd Hayne is set to become the first ex-Australian rugby league player to compete in the NFL after being named in the San Francisco 49ers squad for the upcoming season. The 27-year-old, who has 11 tries in 12 internationals for Australia, has been named in the running back rotation. He told www.49ers.com: "I am over the moon, I've never felt so alive." Former British discus thrower Lawrence Okoye was one of the players the 49ers cut from their roster. The British discus record holder swapped the track for gridiron after the 2012 Olympics in London and has spent the past two seasons with the five-time Super Bowl winners. Parramatta Eels full-back Hayne was voted Australia National Rugby League's best player last year. He added: "I'm blessed and honoured to be a part of the 49ers franchise." Jarryd Hayne joined Parramatta Eels in 2006 and has since played 176 matches, scoring 103 tries and contributing 419 points. San Francisco coach Jim Tomsula said: "Making an NFL roster is an outstanding accomplishment, period. But obviously his situation is unique. "The odds of an American who grows up in this game playing in the NFL is astronomical. Now you're talking about a guy who wasn't raised in this game and has made it. "He's by no means a finished product but the type of person he is and the approach that he takes, he's a guy that we want here. "It should be a celebration in Australia. I do understand the magnitude and that it's huge." On the subject of Okoye's release, Tomsula said: "Lawrence hasn't played a lot of football. "When you have a guy in that situation, it gives him a better opportunity [to find a team]. I will say what he's done in two-and-a-half years is remarkable." Second-year pro Carlos Hyde is likely to start at running back for the 49ers, while Reggie Bush is expected to feature heavily on passing downs, with Hayne and fellow rookie Mike Davis competing for carries in relief.